Local citizens gathered again today to protest the sale of Sarasota County lands adjacent to the Celery Fields Regional Stormwater Facility and the Celery Fields Park. On March 1, 2017, Sarasota County Commissioners postponed discussion and public comment on Rezone Petition 16-33, which involves a parcel of land on the northwest corner of Palmer Boulevard and Apex road. The applicant, who ran afoul of County rules regarding disclosure of ownership interests, plans to construct a 60,000 square-foot Restaurant Depot location on the site. Huge thanks to Stand Up Fight Back SRQ, Adrien Lucas, Tom Matrullo, and others for organizing another great event! Concerns focused in part on the potential effects of these industrial developments on the Celery Fields Regional Stormwater Facility, which helps protect the Phillippi Creek basin from flooding. Protesters want to know why these lands, which are immediately adjacent to the Celery Fields Park, one of Sarasota’s most widely known bird habitats, are being offered for sale at all. “Hands off our pristine land” just about says it! This parcel on the northwest corner of Apex Road & Palmer Boulevard is under contract to a developer whose plans call for a 60,000 square foot wholesale restaurant supply business. The parcel on the southwest corner of Apex Road & Palmer Boulevard is under contract to local developer Jim Gabbert, who plans to build a construction and demolition debris processing plant, where concrete crushers will run for hours every day. Protesters expressed concerns that the construction and demolition debris, yard waste, and the machinery used to crush and otherwise process the debris, will be highly damaging to the wildlife habitat at the Celery Fields Park, and that noise pollution will scare off birds who nest there. Tom Matrullo has been working tirelessly to help raise awareness and rally support for the opposition to the sale of these lands by Sarasota County. PJ Robicheau, photojournalist for SNN, The Suncoast News Network, filmed portions of today’s protest. Filmmaker Darryl Saffer, producer of the Florida Field Journal, was onsite to add to his extensive coverage of the Celery Fields over the years. Adrien Lucas, producer of Atomic Holiday Bazaar, and Gary Walsh, President of Meadow Walk HOA, a nearby community, have both devoted countless hours to saving our beloved Celery Fields. Rob Wright, Conservation Chair for Sarasota Audubon Society, is a perennial presence at any local event focused on protecting the Celery Fields. What better way to show your support for the Celery Fields could there be than sporting a celery stalk? Organizers made this event a family affair and supplied cold water and snacks. Images copyright © 2017 David G. Johnson. Used with permission. Share this photo gallery on Facebook here. In addition to protesting the Restaurant Depot project, many attendees today expressed outrage at the proposed “Recycling Center” being planned for the Southwest corner of Apex & Palmer Boulevard. Rob Wright, Conservation Chair for Sarasota Audubon Society, spoke to many protesters and the reporters present about proposed development projects. 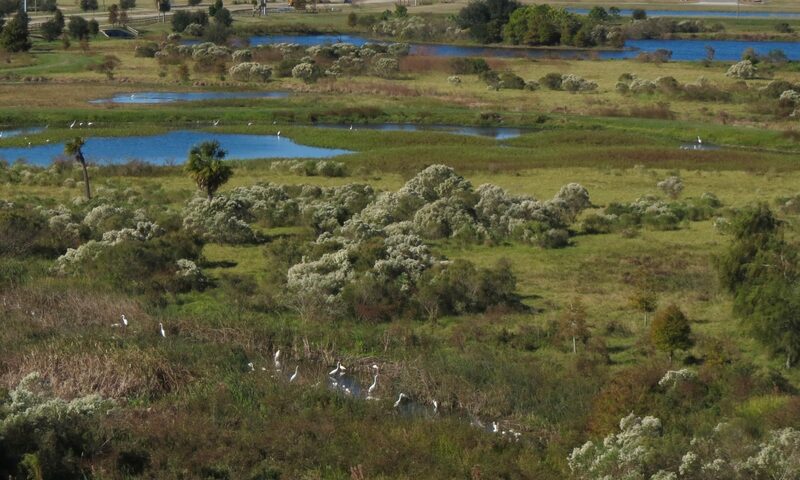 Most just want the Celery Fields to remain the beautiful habitat and park that it has come to known worldwide to be. Protesters focused on keeping birds & other wildlife safe, and keeping the construction & demolition debris from being processed on land adjacent to this beautiful habitat. Adrien Lucas was one of the leading volunteers who helped make the protest a success! Gary Walsh, President of the Meadow Walk Homeowners Association, has been fighting the sale of these lands for some time now. Thanks, Gary! Standing in front of the parcel that is the subject of the March 1 hearing, protesters showed their feelings about the Rezone Petitions for both the Restaurant Depot project and the TST Ventures project. At issue: County-owned lands being auctioned off to industry, jeopardizing the the investment of more than $23M in the Celery Fields Regional Stormwater Facility and the Celery Fields Park. Erika Jackson from ABC 7 and MySuncoast.com captured footage and interviewed protesters and organizers. A few remaining protesters gathered for a photo as the rally wound down this afternoon. Luigi Verace, a volunteer from Stand Up, Fight Back SRQ, captures some of the moments for posting online. Joe Stewart, Past President of Meadow Walk Homeowners Association, and Gary Walsh, President. Meadow Walk is the first residential community to the east of the subject land. This protest was a family affair, attracting Celery Fields enthusiasts of all ages!